Hey foodie friends, it’s a big day! Today marks ONE YEAR since I conjured up the idea of starting up Live Eat Learn. 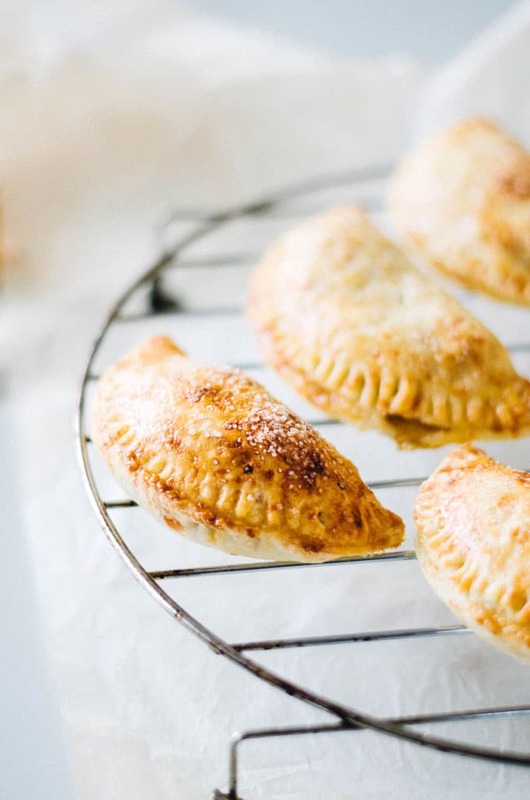 So we’re going to cook up some celebratory apple Gouda cheese hand pies today, but first, isn’t it actually bonkers how much can change in one year? One year ago, the site was on a completely different website platform (Wix instead of WordPress), I was living in Texas, I was in grad school, my diet consisted mostly of stir fry, and I wasn’t sure I was sold on the direction my life was going. Fast forward to today. I’ve left Texas and moved to Holland, I’ve learned to enjoy cooking things that are not stir fry, and I’ve reacquired a feeling of direction in life…and so much of it is because of this blog! And the readers! From those who have been reading since the first day (hey mom and dad!) to those who have just stumbled upon the site today, thank you! Helping you to discover healthy new ingredients and recipes honestly brightens my day exponentially. So to help make this blog as relevant and tasty to you as possible, I’ve created the 1st annual Live Eat Learn reader survey! I want to learn about who you are, what you like, what you need. It’s just 8 questions and I’ll be forever indebted to you in tasty treats! CLICK HERE to be redirected to the survey. And so in celebrating the blog’s birthday, let’s make some pie. 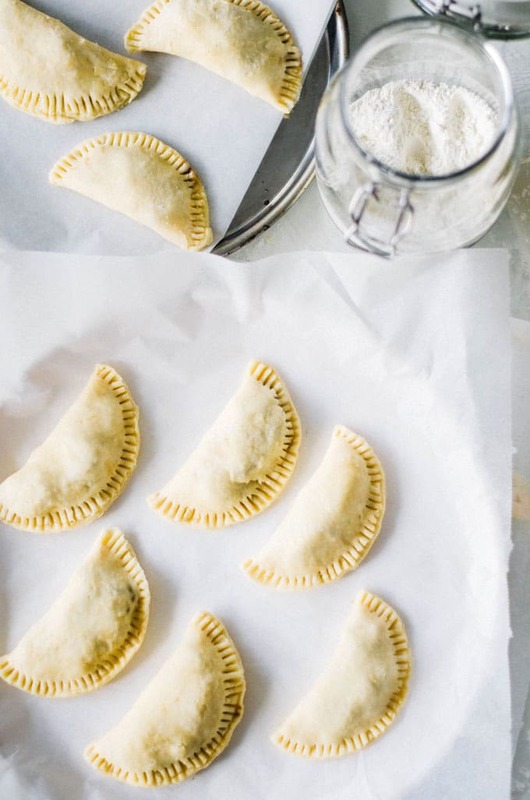 But let’s make hand pies because ain’t nobody got time for dishes. Or forks. We’re all about Gouda cheese this week, and so are these pies. 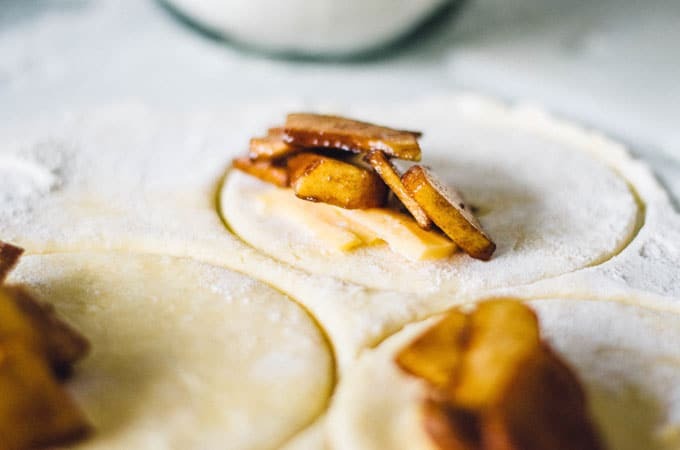 We’ll incorporate Gouda into the flaky, all-butter crust as well as in with the sweet apple filling. They’re great fresh out of the oven, or cold, or the next day drizzled with honey for breakfast, or sneakily when you think no one is watching and you’ve already had three so people may begin to judge you. I guess what I’m saying is, even though we’re making these for this very special occasion, they don’t require an occasion at all. Make these everyday, all day, whenever your hungry heart desires. 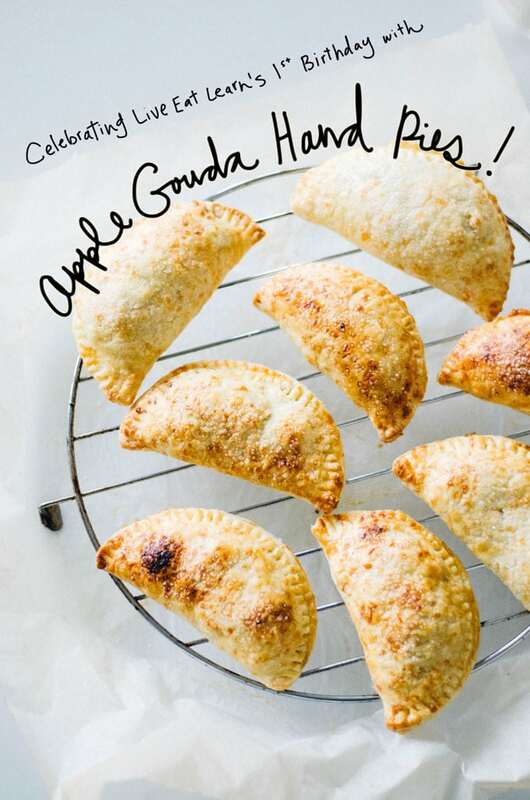 Sweet and savory apple Gouda hand pies in a flaky, golden Gouda cheese crust. In a large bowl, mix flour and salt. 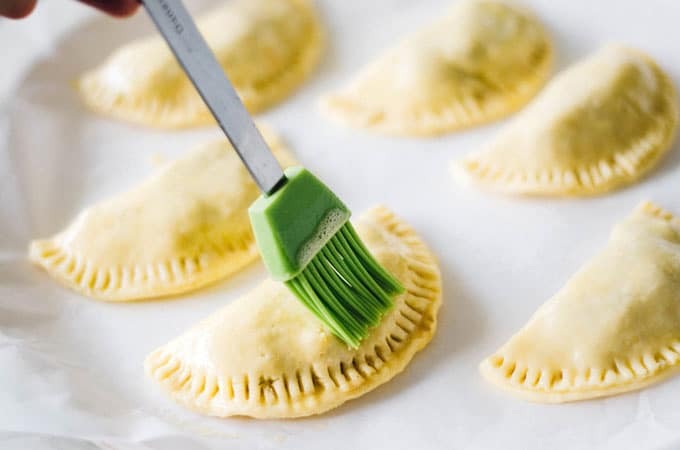 With a pastry cutter or forks, mix butter and shredded cheese into flour until dough is crumbly and pea-like. Add water, 1 Tbsp at a time, just until dough holds together. Shape dough into a ball, wrap loosely in plastic, and flatten gently with a rolling pin to form a thick, pancake-like disc. 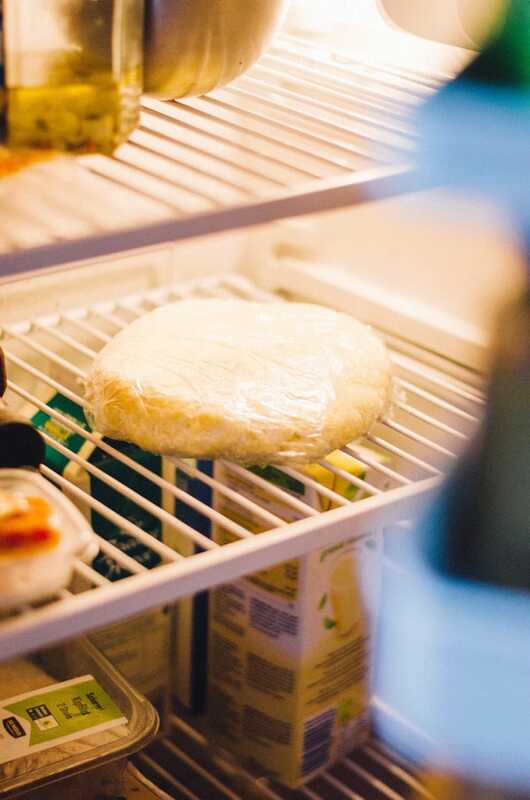 Set plastic-wrapped dough in fridge to chill for 30 minutes. Peel, core, and chop apples into small chunks. Into the apples mix lemon juice, brown sugar, cinnamon, nutmeg, and flour. Add more flour if filling is runny. On a clean, well-floured surface, roll dough to ⅛ inch (.3 cm) thick*. On one half of each circle, set a small, thin slice of Gouda cheese. Top with a spoonful of apple filling. Brush whisked egg around the edges of each circle, then fold each circle in half. With a fork, seal the edges. 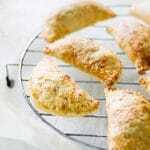 Place hand pies on a parchment paper-lined baking sheet. Brush each pie well with whisked egg and sprinkle with coarse sugar. Bake at 400 degrees F (204 C) for 15 to 20 minutes, until golden brown. Use a mature Gouda cheese. The younger cheeses will be too gooey for this recipe, while the deep flavor of the extra old cheeses will overpower these pies. *If you’re like me and don’t actually have a rolling pin, use a bottle of wine! Place a piece of parchment paper on top of the dough and roll away. **Unless you’re a pastry master chef, you may not have one of these. Use a wide mouth cup of mason jar! Stunning photos! I love the pies, so yummy! These look amazing! I love Gouda cheese! Great recipe, I know my son would love these. A great new idea to add to his lunch! These would be great as a little lunch treat! 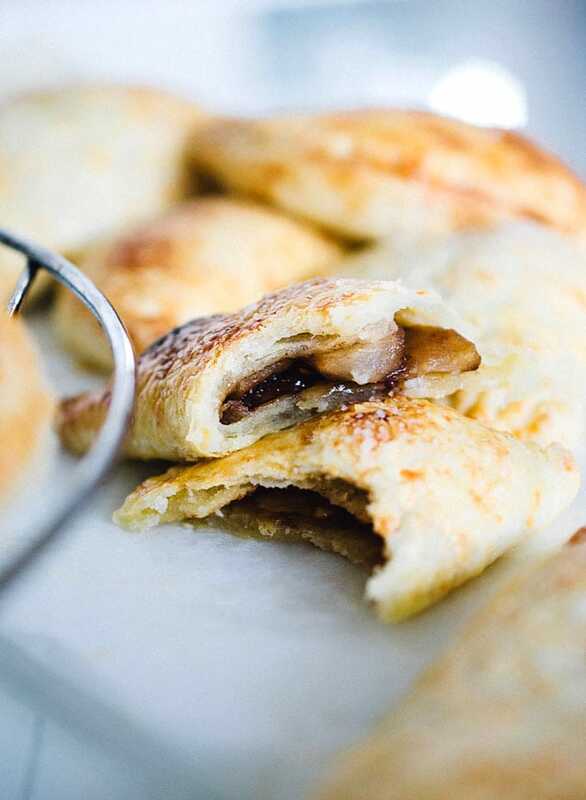 The dough isn’t sweet so you could even make this savory by adding in a spoonful of veggies in place of the apples. Lunch and dessert, bing bang boom! I like your blog layout, neat and clean…photos are pretty to look at too! yummy! These look delicious and your photographs are so beautiful! Wonderful photos that captured my attention for sure… and my appetite!!!!! Wow – these things look so good – I bet they are scrumptious!!! And Holland! Wow, wow – looking forward to reading about your life and adventures, living there too! Yummmmmm. This sounds amazing, and I really want to eat it. There used to be a cute little bakery/sandwich place near my work that made a panini that was apples and brie, and it had walnuts too and you dipped it into this sweet vinaigrette too. It was my favorite thing ever, but sadly they went out of business and I’ve not found it again anywhere. Oh that makes my belly rumble! It sounds like that would be easy enough to recreate, you should give it a go! 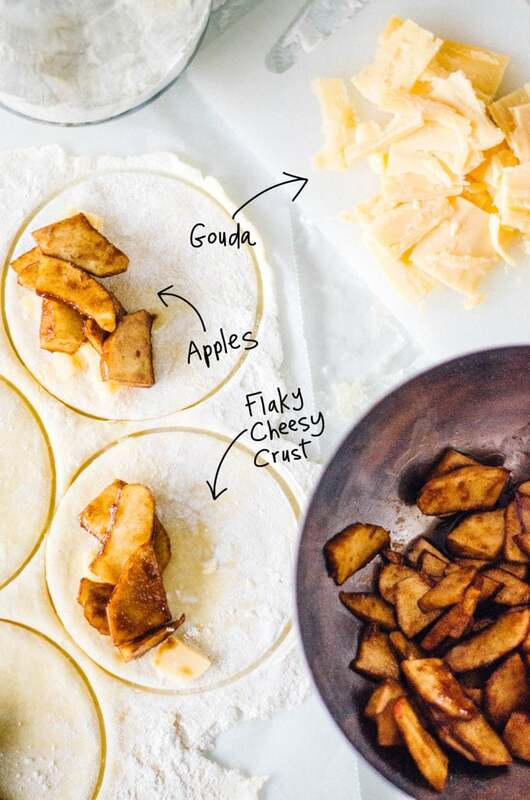 Apples + cheese are just a perfect combination. These look amazing! What a great snack idea! Yum! 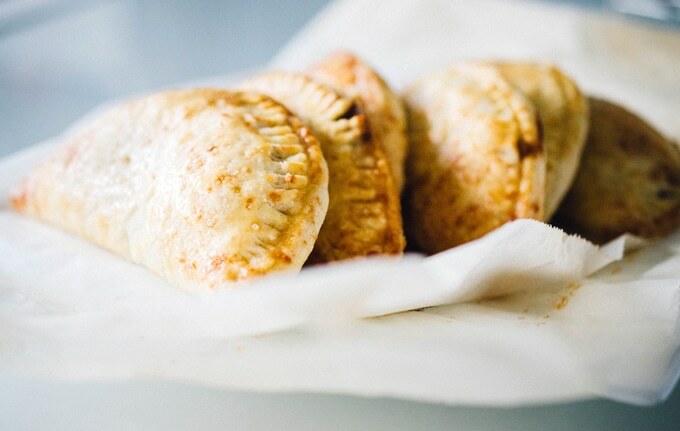 I love the combination of apples and brie and these hand pies are so pretty! I didn’t even try to resist this recipe. Hand pies are my favorite, followed by gouda. I don’t actually have gouda on hand so i’m thinking of whipping this up with some cheddar. yum! Cheddar would work really well in these too! I actually thought of the combo because my grandpa always serves us apple pie with a big slice of cheddar 🙂 Enjoy, Tara! 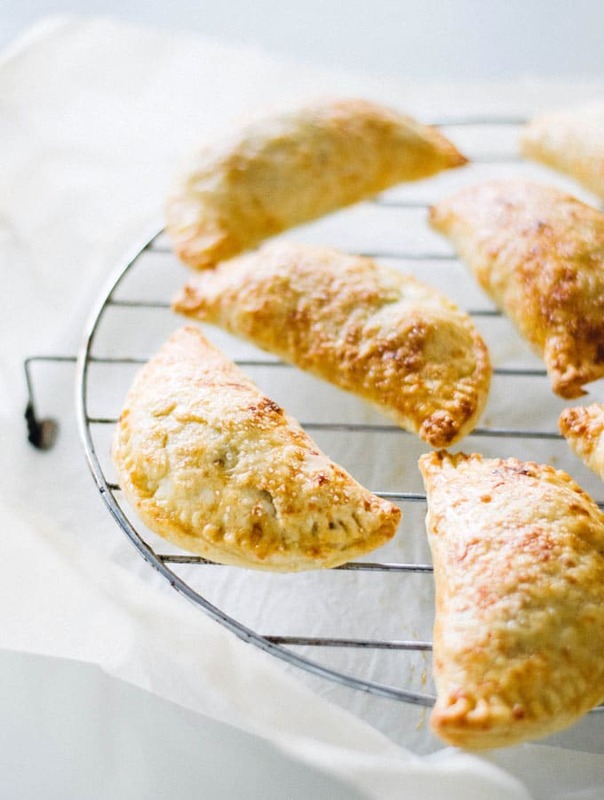 Congrats on your 1st Blog Birthday 🙂 These hand pies look so divine and delicious. Perfect for the clelebrations. Oh my goodness, these sound heavenly!